I am inspired by these bathrooms. Each has an idea that I would recommend incorporating if you are planning a renovation. 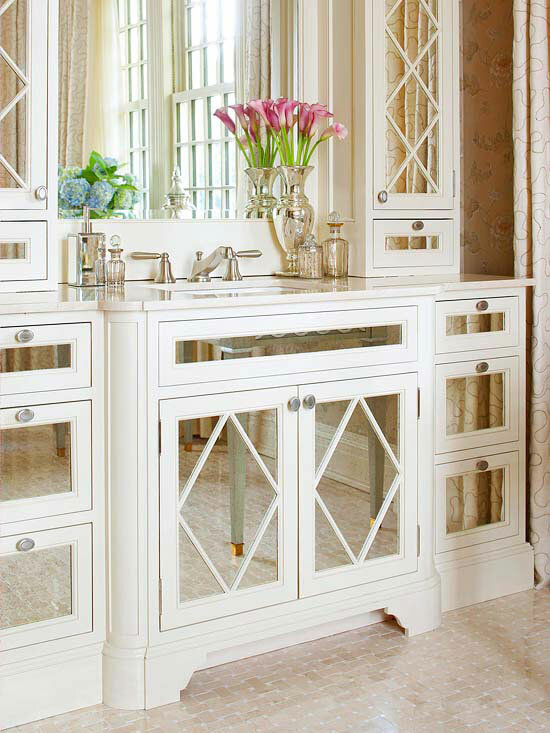 I think this mirrored vanity could really make a small space feel bigger. I love the floating drawers above the toilet, great extra storage. 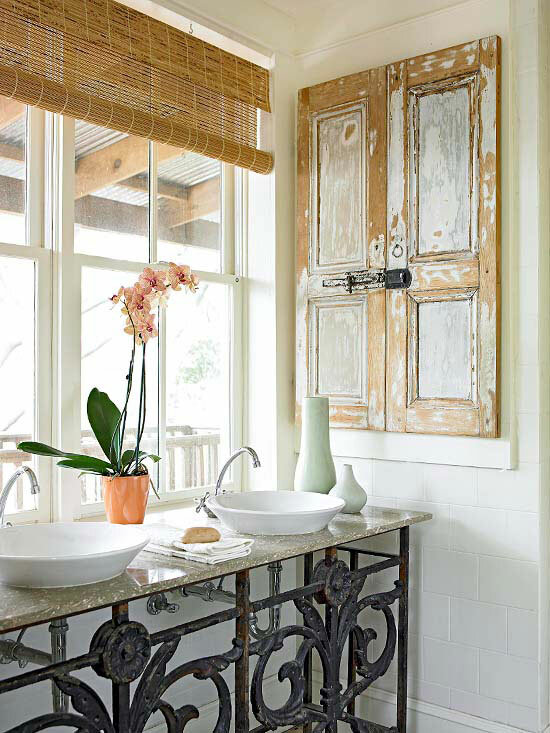 This is a fabulous idea…using doors from a vintage or antique cabinet on a built-in unit. 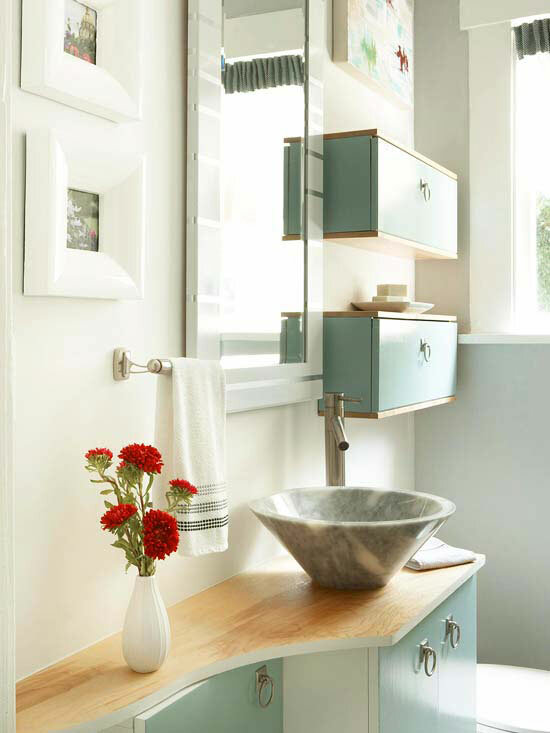 This off-center vanity helps you to use a small space wisely. I love the shower boxes in this all white shower. The glass tile is very effective. 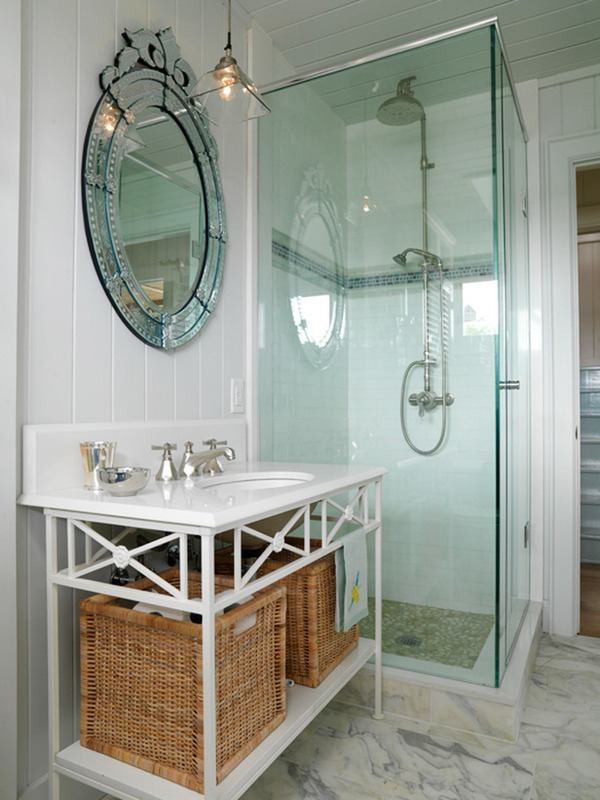 All glass showers open up small spaces…this is a great use of a small space. 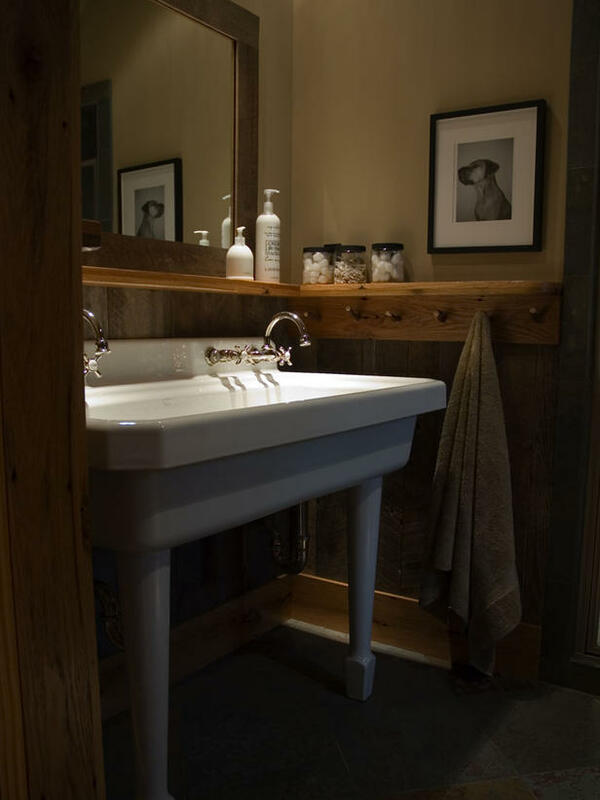 This open old-fashioned double sink is a great way to allow two to use a small area. The peg board towel rack is clever too! 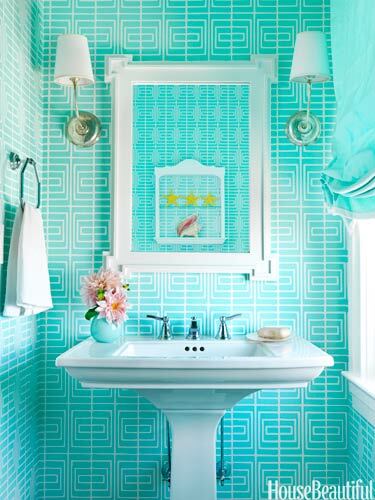 Using a large print or bold colored wallpaper in a small bathroom can give it pizzazz. I love designing bathrooms. They are so important to a home. The key to a well designed bathroom is to use every inch of your space. Measure your space and full it up with function! 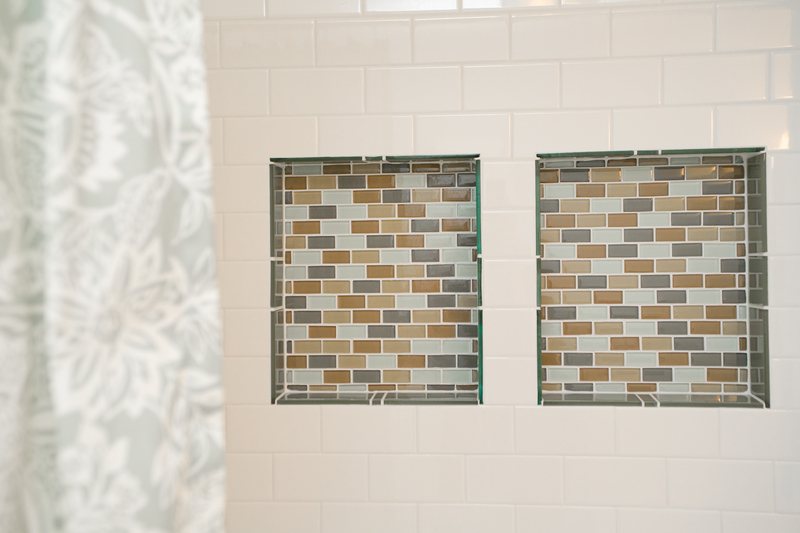 Are you doing a bathroom renovation? Let me know what you are doing, send photos and ask me about your dilemmas. Thank you for stopping by. Keep cool in this hot weather. PS If you are not already a member of the CBD club please click the follow button. Lovely ideas! My bathroom is small size, so I try to make it more spacious. For example, I have big mirrors, clear colours, and a good lighting. I have also a counter top with wide cabinets below. Thank you for the comment send me a picture of your bathroom I would love to see it. I found your website because I have been searching and searching for a bathroom vanity, as we are redoing our bathroom. I have become so frustrated and even sad because I can’t find anything that’s right for our space and my taste; I do not like the standard generic vanities sold at the big stores. The walls of the bathroom are the palest shade of gray, the shower tiles (and part of the walls) are also light gray, the trim is white, the floor is going to be 12″x12″ polished white cararra marble, and for the vanity I want white cabinet preferably with some sort of legs, with a white cararra marble top, with beveled edges and beveled backsplash. I like vintage and antiques, and my 1954 house has a quiet “beachy” feel to it, as we are right close to the water. I have toyed with the idea of making (having someone make!) a vanity out of a piece of furniture, such as a cabinet or dresser, but I don’t really like the idea of just drawers in my vanity like a dresser would have, I don’t want anything too cute or trite, and I don’t know how to go about getting a sink and marble top for it. 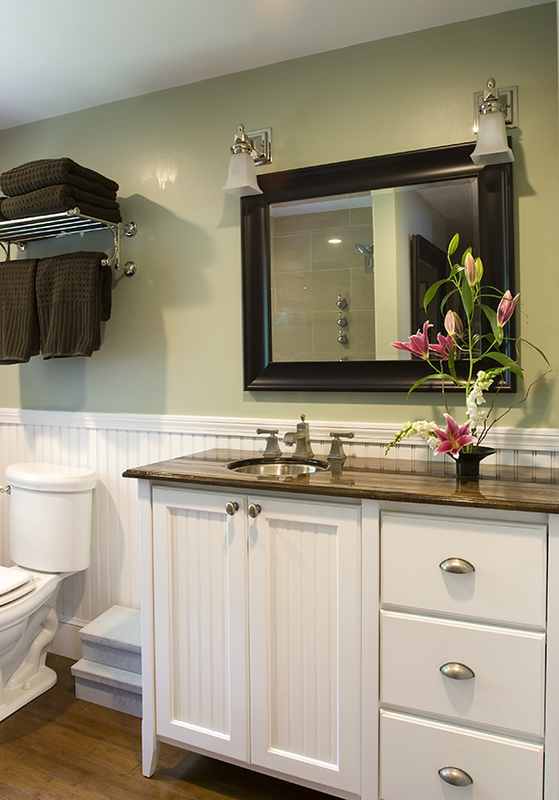 The size of the vanity currently in the bathroom is 31″ wide, 19.5″ deep, and 32″ high. We could go as wide as 36″ if the sink were set on the left side (the toilet is just to the left of the vanity but there is extra room on the right). I don’t think we should go deeper than 20″, as the tub is only a couple of feet behind the vanity, but the height is flexible. I’ve also wondered about having something custom made, but I also wonder about the cost of that, and I have no idea how to go about finding anyone who would be experienced at making something for me, either vintage or new. I feel completely overwhelmed and clueless in trying to figure this out, but I want so badly to get just the right piece that I will love for years, not something I settle for because I can’t do this anymore. Help?? Mary I can help! Email me at celiabediliadesigns@gmail.com and we can get started. I just customized a wordpress theme.